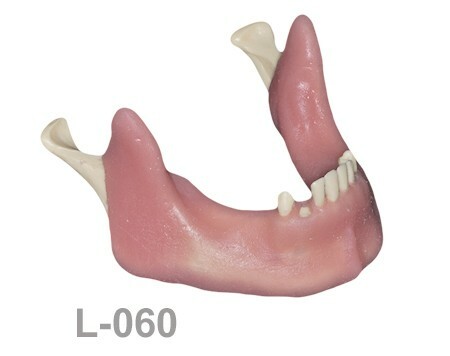 L-060: Partially edentulous mandible with cortical and cancellous bone with two fenestrations. 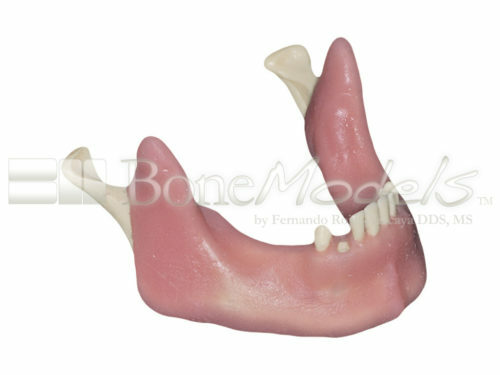 Partially edentulous mandible with soft tissue, with teeth from first right premolar to first left premolar, with cortical and cancellous bone in lateral zones and anterior zone. Two fenestrations under the sockets canines. Thin right ridge for horizontal bone augmentation and thick left ridge ideal for vertical bone augmentation. Ideal to take block grafts.